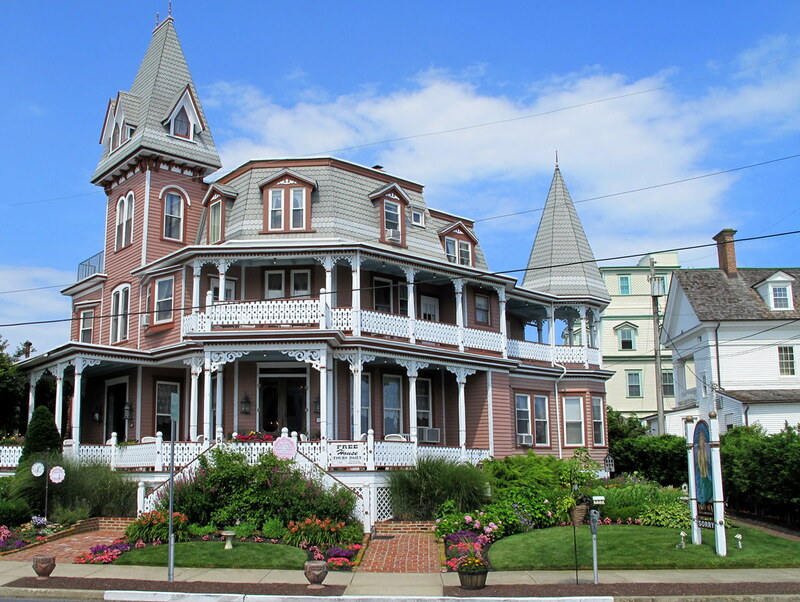 There’s a pretty amazing bed & breakfast in Cape May, N.J. Angel of the Sea is in several top ten B&B lists and it’s easy to see why…. In 1881, Weightman decided he wanted an ocean view, so he hired some local farmers to move the “cottage.” It was too big, so the farmers cut the building in half and spent all winter “pulling the sections on rolling tree trunks with mule and horse power.” Can you imagine? This is the second half of Angel of the Sea. From 1962 to 1981, the houses were used as a dormitory for students from Shelton College, but weren’t properly maintained. These beauties were abandoned until December 1988, when John Girton, a builder and developer, and his wife Barbara bought it. 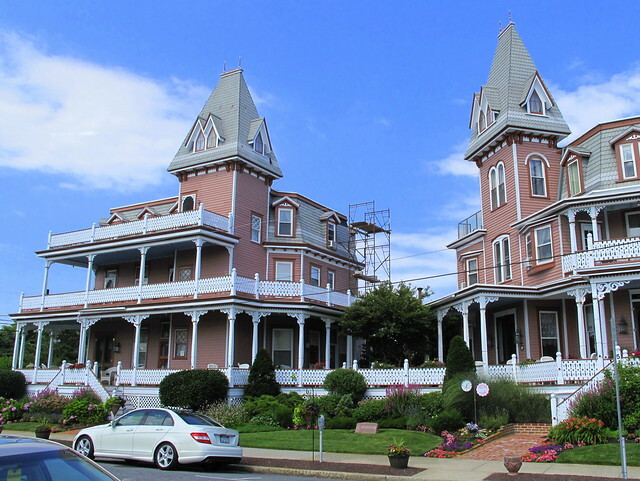 Eighteen months and 3.5 million dollars later, “the most complete Victorian restoration in New Jersey” was completed. The ocean view that Weightman wanted, from the verandah. I think I could get used to eating breakfast here every morning. How about you? 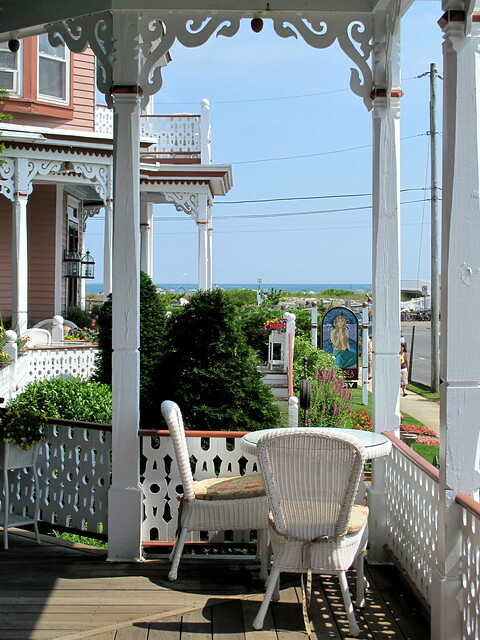 This entry was posted in photography and tagged Angel of the Sea, bed & breakfast, Cape May, gingerbread, N.J., ocean view, Victorian-era architecture, wraparound porch. Bookmark the permalink. I could definitely get used to that view. Such a beautiful house and what a story. It isn’t exactly what I associate with the term “cottage”. Bit of an understatement. That’s for sure. I once lived in a cottage (no quotes) and it was about 500 square feet! I loved it, but there was no closet space to speak of. I’ll have to do a post on that sometime…. That’s a summer home? I can’t even imagine what his main home looked like. It sure must have been even more impressive when it was one complete house. How amazing that the builder restored it to its former glory. Oh, I know! People have different ideas of “cottage,” that’s for sure. On the web site it said that the restoration crew worked around the clock. Literally. It was an old Craftsman cottage built in the 30s, Jeanne. Not nearly as romantic as Cape May, but it had a certain charm. I’ll dig up the photos one of these days. What a lovely place. I would love to sit there and read and never return to work. Carole, I love the B&B shots as well as the fascinating bit of ‘moving’ history you tell! Donna Morrissey, a Canadian author from the east coast describes in her novel, “What They Wanted” how the house was moved ‘… 40 miles up the bay …’ by sawing it in half, etc. You might get a kick out of the book (https://cherylandrews.wordpress.com/2010/02/19/what-they-wanted-by-donna-morrissey) if you should ever have the time in your hectic life to slow down, put your feet up and do nothing, except read, of course! I highly recommend it. Thanks for the link, Cheryl! I am making a serious effort to slow down the pace and it feels great. Going away for five days too. 🙂 How’s the book coming? I’m so pleased to hear the slow down feels great … enjoy the five days away, Carole! The book? 57 (voice) files to transcribe on my little hand held digital recorder but, I can’t muster up the courage to listen to my own whiney voice for that long. This vacation week is nearly over – thank God. I’m exhausted from limbing trees, tossing rocks, hauling deadfall at the new property. I need a vacation from this vacation!